Please download our white paper for further market trends and how the Senoff Loop is positioned for growth. Q:Will The Senoff Loop work on my phone? Yes. 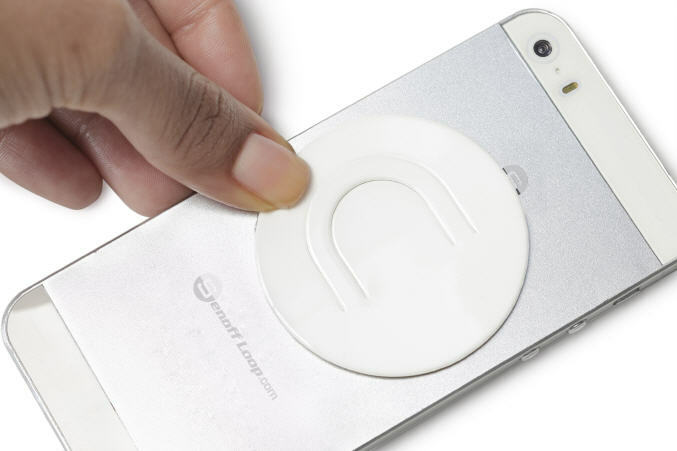 If your phone has 2 inches of a flat, hard and smooth space on the back of your phone, the Senoff Loop will stick without any problem. It will not stick well on textured or rubber phone cases. There are a couple of unusual phones that don’t have the necessary space due to a 3D camera or an opening for the battery cover. If you’re in doubt of whether or not you'll have enough space, measure. But most likely the answer is yes. Q:Is it easy to attach ? Yes.Simply follow the directions below. HOW TO USE: We recommend sticking the Senoff Loop to a rigid, smooth, and flat surface. Textured, Silicone, rough, or flexible cases may not bond or perform as well with the Senoff Loop, causing a greater risk of damage to your phone if the Smart Loop becomes loose. PLACEMENT: Decide where on your device to place your Senoff Loop. The majority of users choose the center of their device. If you use your touch screen with your right hand, place the top of the loop facing left. Lefties will want the top of the loop facing to the right. CLEAN: Clean the back of your phone for the optimal stick. Oils, lotions, and dust will lessen the grip of your stick pad. Use an alcohol wipe or hand sanitizer to clean the two-inch diameter area where you want to place your Senoff Loop. Allow time for the area to completely dry before you attach the loop. PEEL: Peel the blue protective liner away from the Senoff Loop, exposing the Senoff Stick Pad. Do not touch the stick pad. 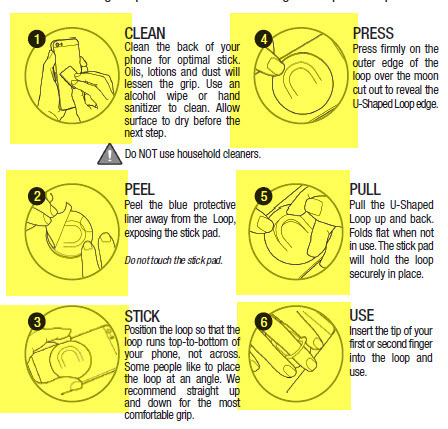 STICK: Orient the loop so that the loop runs top-to-bottom of your phone, not across. Some people like to place the loop at an angle. We recommend straight up and down for the most comfortable grip. Position your Senoff Loop over the desired area, then press and hold for 10 to 20 seconds to secure. The Senoff Stick is a fascinating material. It's flexible, clear, durable, removable, repositionable and retains its sticky properties use after use. 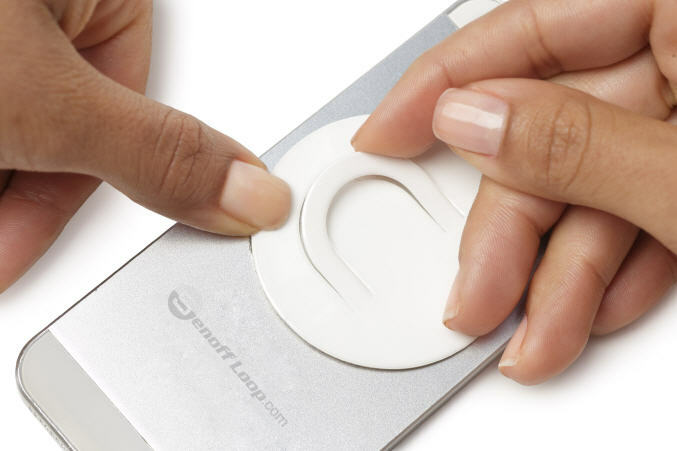 Unlike VHB, permanent tape or glue, Senoff Stick won't damage your device or case. But it's strong enough to hold your Senoff Loop securely to your device. The Senoff Stick Pad adhesive will be at 100% in three hours. If you choose to use the Senoff Loop before the stick pad becomes 100% effective, please do so with care. PRESS: Press down on the outer side of the loop over the moon cut out to reveal the U-Shaped Loop edge. LIFT: Pull the U-Shaped Loop up and insert your finger. Or for a looser fit, simply bend the loop all the way back, making the loop looser. 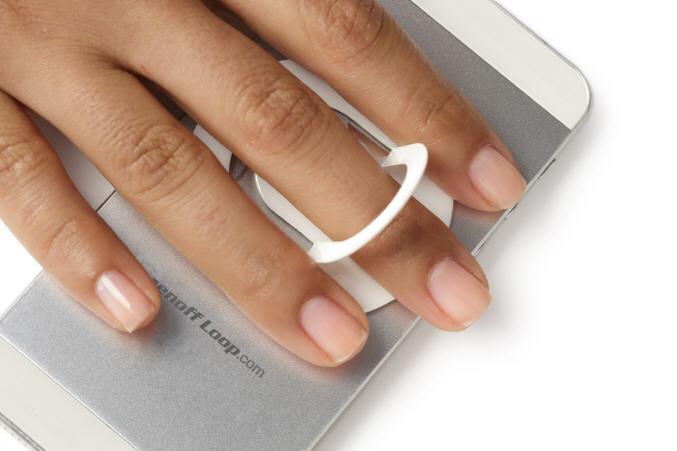 You control how tight you want the loop on your finger. Fold the loop down flat when not in use. The Senoff Stick pad will hold the loop securely in place but not so securely that you can't get the loop out and up again. BEND: Bend the loop all the way back SLOWLY from the crest of the loop. Enjoy the ease and comfort of using your touch screen with one hand. Q:Can I use The Senoff Loop on my Nook or Kindle? Q:Where are The Senoff Loop products sold? Q:Where is The Senoff Loop made? Q:How long does it take to ship? The Senoff Loops ordered within the continental USA will be sent via USPS mail unless other arrangements are made. Delivery is typically 2-3 days in the USA, and 7 to 10 days for international orders. Q:How do I remove it if I need to? Is The Senoff Loop re-usable? You can remove the Senoff Loop by pulling very slowly from any side of the loop. Do not pull on the flip out loop or you may break it. If you pull the stick pad too fast, you risk tearing it. Take your time. 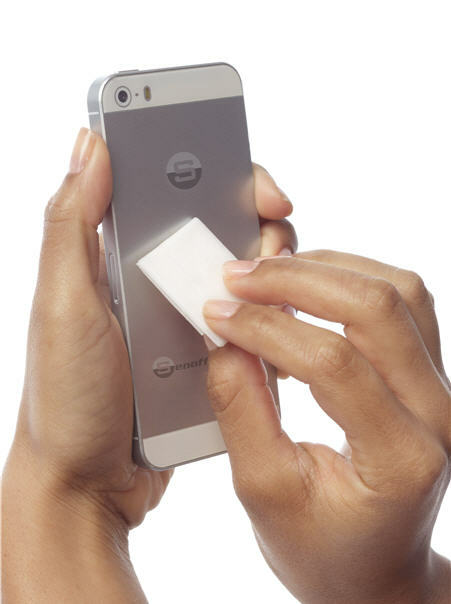 Once the stick pad is removed, you can reposition it to your phone or phone case at the angle you like best. The Senoff Loop sticky pad can be rinsed under warm water to recharge the stick. Do not use soap, detergents, oils, or lotions to wash your stick pad or it will lose its aggressive stick capabilities and you'll need to order replacement pads. Re-use the stick pad over and over. Additional stick pads can be purchased at our order page. Q:How many times can I lift and close the loop before it breaks? The Senoff Loop is made by a very interesting combination of materials. Don't mistake this as paper. It's NOT paper. It's taken years and research and design to come up with a product that is long lasting and works. We've had the ring lab tested and certified to open and close without any breakage up to 3000 times offering users up to a year of worry free use. Q:Can I license or private label your Senoff Loops. Yes! You may sell, license or private label our invention. Please consider the reasons why. * Full-color high-resolution imprinting, logo and branding options- full bleed. 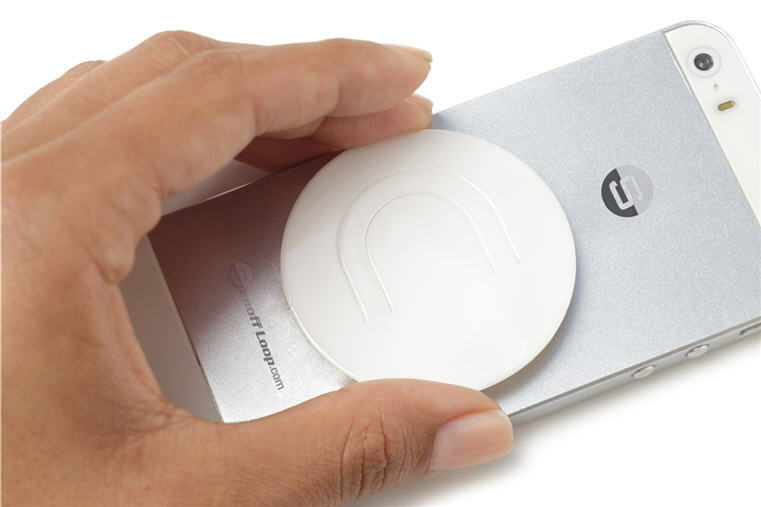 * Tested invention that works for anyone who uses a mobile device. * Light weight - you can mail with a 2-page marketing message for under an ounce (1 stamp). * High perceived value - a three pack can sell for up to $20 each. * Fast production and ship time * We control 100% rights to this product. * Intellectual property protection - we have five patent applications in place. * All materials, manufacturing in San Diego, California - No Cheap China! * We can license our manufacturing and material processes globally if needed. You can brand with your packaging, name, and logo. You'll own and control your product, packaging, and assembly or we can do it for you. All your marketing and sales efforts lead back to you. We can work with you to create the loops of your dreams. We print full-color photo quality printing on each Senoff Loop. We'll include your logo, brand website and more. Q:What other details do I need to know about ordering Branded Senoff Loops with my own company logo and contact information? 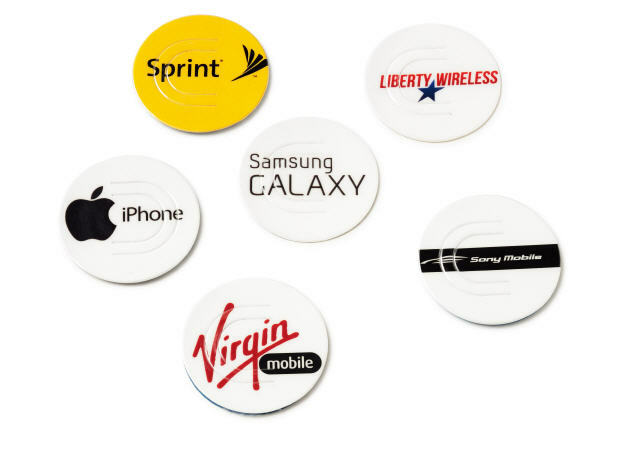 We can make your cell phone loops for your brand. We private lable for retail, wholesale and more. We'll print, asseble, package and ship your orders for you. Here are the details below. Do You Charge For Proofs? There is no charge for proofs. Set-up charge is only $40 net. Set-up includes standard stock design backer card and front and back sides of the loop. 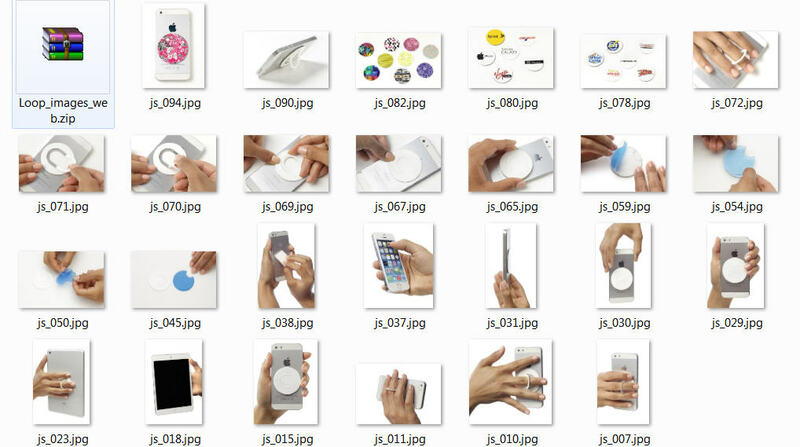 There are die charges for custom shapes other than our standard 2-inch circle. Call or Text Michael Senoff 858-692-9461. Minimum Orders for custom die shapes are 5000 units. Regular loop minimum is 250 pieces per design. All loops include unlimited full color digital process printing. Pantone matching is free. No charge for color changes throughout your order. Example: 50 with blue background, 50 with white background, and 100 with a red background. All carded loop items are individually booger glued to a 4X6 inch backer card. Backer cards can be poly-bagged for an additional $0.20 per unit. A large assortment of optional packaging is available, including boxes, bags, and retail displays for an additional charge. Country of origin is USA and will be marked on all backer cards for all products. Loop may be ordered in bulk without backer cards. All bulk loop orders are sent unassembled. 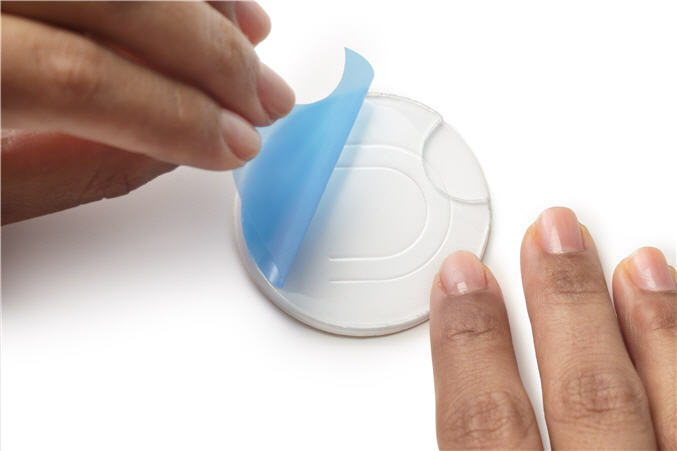 The printed plastic 2 inch disk will be sent separately from the 2 inch adhesive stick pad. Pads and Loops will be sent in units of 500 per bag. Instructions will be sent for information on fastest assembly methods. For stick pad assembly, add an additional $0.12 net per unit. Camera ready preferred. Artwork can be created by our in-house art department at $45 per hour after a purchase order is received. PMS color matching available for free of charge. Artwork formats accepted: ai (CS2), eps (CS2), cdr (12.0), pdf, psd (CS2), gif, bmp, jpg. (PC preferred). Preproduction samples are available with a $95.00 net deposit plus any applicable setup charges and 1-2 week delivery. Upon approval of sample, $95.00 net is applied to the order and an additional 1 1/2-2 1/2 weeks is required to complete production on orders under 2500 units. For orders more than 2500 units, add an additional 1 to 2 weeks. Normal production time is 2 1/2 - 3 1/2 weeks after artwork approval. Many orders can be rushed please call 858-692-9461 to discuss. A rush charge will be incurred based on quantity and in hands date. Authorization for overnight shipping will be required to meet your in hands date. All orders are shipped via UPS or FedEx unless otherwise arranged, F.O.B. California. A $6.50 handling charge per box is applied to every order shipped. We cannot be held accountable for carrier delays. For drop shipping or split shipments, add $5 per location plus freight/handling. A list of addresses is required with a purchase order. Add $6.50 per box for 3rd party shipping. If shipping via USPS, an additional $10 charge will be applied. All orders must be prepaid unless qualified for a credit account. We do not assume any liability for trademark or copyright infringements. All quoted prices are subject to change after the quote, based on artwork requirements. Prices are valid for 30 days after citation date. Only quotes done in writing will be honored. Additional random samples are available upon request. A UPS or FedEx account number is required for rush samples that cannot be sent via standard USPS. Any cancellation of an order in progress will be submitted to all costs incurred to that date. Any change must be in writing. If our Art Department has created the artwork before cancellation, a $40.00 (P) charge will be incurred. The customer is responsible for all surcharges from the carrier if a wrong address is given on your purchase order. Most major credit cards are accepted. PayPal is accepted. The PayPal address is senoff.michael@gmail.com Surcharges may be applied on individual orders due to high processing rates. All items are manufactured in the USA and will have the country of origin marking in accordance with US Customs regulations. Certain circumstances require a country of origin sticker or stamp on the product. All items made by JS&M Sales and Marketing are manufactured in the USA. Note that all photos below are unbranded and will NOT lead back to me. You are free to modify the images for your use. I've included a zip file of the vector images of the illustrations seen in yellow for you to use on your packaging or web site. Right click to download vector illustrations for the application directions for using the loop.